we had a new ferry. i present this information in the past tense because the boat under consideration is currently not serving the islay route. in fact, it hasn't been here since the beginning of december. in point of fact, it was never truly ours in the first place; it simply suited the caledonian macbrayne marketing machine to present it as such. in reality, all they had done was added another boat to the fleet, subject to be sent hither and thither as logistics decreed. the first clue was a distinct reticence to allow the vessel to be named isle of islay. it was also a somewhat suspicious feature that, a few months prior to completion, it was almost surreptitiously pointed out that the boat fitted none of the three piers it would require to use when introduced to service. the reason given at the time for the restriction of name choice was two-fold; firstly, calmac claimed to be receding from the practise of naming their boats after specific islands, and secondly, they claimed that the isle of islay name had been already registered and was thus unavailable. the latter was easily proved to be an untruth, as our local newspaper registered the name and offered it to calmac on behalf of the community. you will be unsurprised to note that this was politely, but firmly refused. the boat currently sails under the name mv finlaggan, voted for by the islay community as being the most appropriate from the presented selection. none of the alternatives proffered had any connection to our island whatsoever, while that chosen was the seat of power for the lords of the isles in the middle ages. the fact that the boat currently substituting for the absent mv finlaggan is named mv lord of the isles (or lottie to which it is more regularly referred) seems not to bother the powers that be. there is, of course, a particularly valid reason as to why our boat is currently further north, all to do with substituting for the outer hebrides run while their boat is in for its annual re-fit. though this does, in the grand scheme of things, make perfect sense, it may give credence to the high regard in which the company is held locally, that the majority of us had private bets as to how long we'd be likely to hold onto our boat. the naming of ferries on the west of scotland must present something of a minor problem. public relations dictates there ought to be some connection between the boat's name and the route it is/was primarily designed to serve, yet presumably not present the level of incongruity experienced when the islay route was served by the mv isle of arran. and you can see a concomitant need to provide naming conventions for many other items and products that sit well within their respective milieux. though that may be perceived as a logical notion, sometimes it's a premise that fails miserably. a colnago arte, for example, falls somewhat short of the mark, in my opinion as indeed does a carerra vanquish. but the premise is no respecter of category and ought therefore to apply equally to items of cycling apparel. and while i have not a solitary notion as to the reasons behind its nomenclature, the latest jersey to appear from remi clermont's cafe du cycliste bears the impressive epithet marie josette. i live in hope that somebody asks me the name of this rather striking jersey. 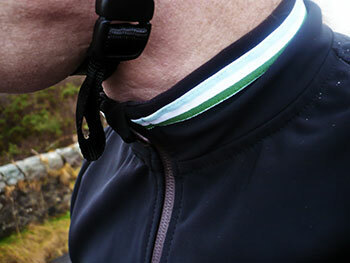 it is, curiously for this time of year, a short sleeve jersey, but one that offers the immeasurable benefit of a fearsome degree of wind and waterproofing. the black fabric of which it is constituted is perhaps more regularly associated with the science of jacketry, yet makes perfect sense as a jersey. even a short sleeve one at that. 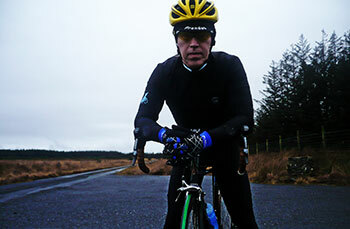 such is the ambient temperature in the hebrides come early february, there wasn't the faintest chance that it would be worn sans armwarmers. 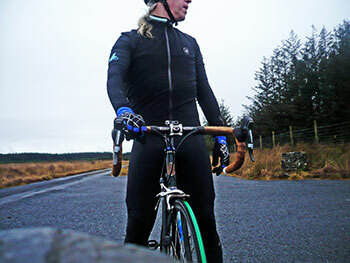 in fact, if i'm bluntly honest, i rather baulked at the idea of riding without an outer jacket in the first place. 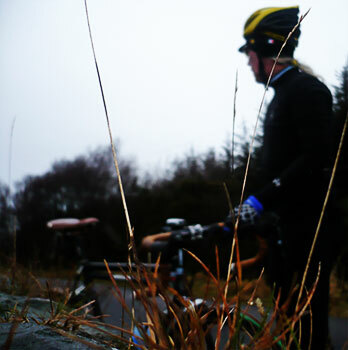 however, if ever there were an individual ready and willing to suffer for your art, it is me; the ideal opportunity, i thought to mtfu and go ride in the rain no matter the chilling consequences. i ought at this juncture to confess to a modest lack of faith, stuffing a rainjacket into one of the capacious rear pockets before leaving the croft. and just in case you query the wisdom of a waterproof jersey with waterproof full-length zip featuring open to the elements rear pockets, let me disaffect you of your presumptions. those three pockets are covered by a reflective flap, intent of keeping the worst of the elements at bay. so far, so good, but i cannot deny that said flap does have an annoying tendency to get in the way of retrieving the appropriate means with which to pay for a soya cappuccino and a cheese and tomato sandwich. and disappointingly, there is no zipped fourth into which defined valuables could be entrusted. 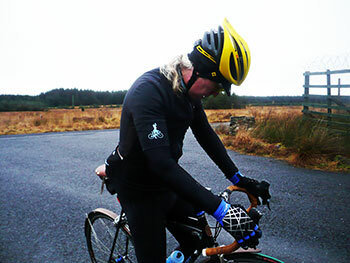 however, wearing the marie josette over a baselayer and thin short-sleeve wool jersey, replete with armwarmers, was cosy enough on a day when the mercury failed to reach double figures. and a day on which it rained persistently from leaving to returning; not a tumultuous rain you understand, but neither was it one that gave up easily. on a clandestine check in the coffee shop (you never know who's watching), there was no sign of any water ingress to the wool below. not anywhere. which, i don't mind admitting, was rather impressive. the high, fleece-lined collar with most attractive green, blue and white piping on the outside, features the almost ubiquitous zip-garage to protect the nape of the neck. the fit is excellent; the review sample was a most comfortable and form-fitting medium size, offering more flexibility in use than the fabric's tactility initially suggested. and i was most grateful for the space to conceal a thin but warming jersey underneath. though forced upon me by climatic circumstances, a subsequent ride necessitated an outer shell that might offer an increase in cosiness, thus concealing the light-blue flocked logo on the right sleeve from admiring glances. sometimes needs must. this however presented a potentially inflexible four layer apparel sandwich which turned out to be nothing of the sort. 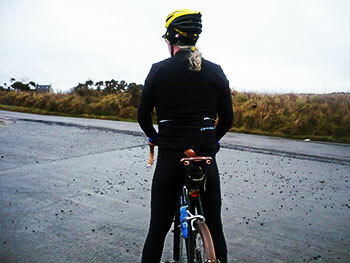 if acquiring a cafe du cycliste, marie josette short-sleeve jersey under trying weather conditions, fear not for your regular constitutionals in the saddle; marie josette's middle name is versatility. when push comes to shove, come fair and warmer weather, the fabric's breathability will not only prevent overheating, but offer added protection from the sort of invasive precipitation that has a habit of sneaking up unannounced. it is part of the great british tradition, and perhaps rather obviously, given josette's nationality, a tradition that has its moments across the channel too. i did ask remi if he'd considered offering the jersey as a long-sleeved garment? "We wanted it to be a versatile product and thought a short-sleeve version would cover a wider range of conditions. 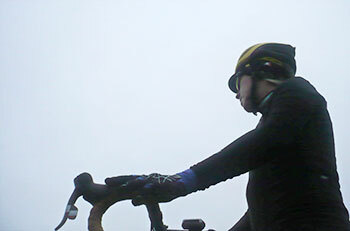 of course it would be good to have at least matching armwarmers in same waterproof fabric or a long sleeve version. maybe in the future." we're just heading towards the time of year when marie josette makes perfect sense, if that's not already the case. it's a clever idea well executed, at a sensible price that makes me look far more svelte than is truly the case. i just hope someone asks me what it's called sometime soon.